Paquiao 's extreme force shocks Diaz! Manny Pacquiao won again and claimed yet another title in four different weight divisions after knocking out David Diaz in the ninth round of their WBC lightweight championship contest in Las Vegas. The Filipino hero has already won belts in the flyweight, super bantamweight and super featherweight divisions and had far too much skill for an outclassed Diaz. Pacquiao came out fighting from the outset, throwing and landing more punches than his opponent who struggled to cope with his come-forward style. Diaz early on sustained a pronounced cut above his right eye and another across the bridge of his nose as Pacquiao caught him with some good clean shots. Despite Pacquiao's onslaught, the American tried to battle on but could make little impression as an attacking force as Pacquiao continued to catch him with a series of right hooks and jabs. Eventually the end came in the ninth round as Pacquiao sneaked through a left that sent a bloodied Diaz tumbling to the canvas which led to referee Vic Drakulich calling off the contest before even counting to ten. 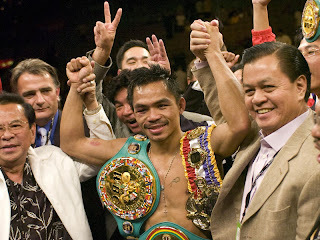 Pacquiao was pleased with his performance and admitted he thought the end might have come sooner. "I feel much, much stronger and more powerful at 135," he declared. "This is where I plan to stay. I did real well. I was really surprised it wasn't stopped sooner." Diaz admitted defeat and conceded he had been well beaten and paid tribute to Pacquiao's hand-speed. "It was his speed," he explained. "It was all his speed. I could see the punches perfectly, but he was just too fast. "He boxed me more than I thought he was going to box. I said to (trainer) Freddie (Roach), 'It's the best I've ever seen him box.' Freddie said, 'Me too."